Looking to watch NCAA football without cable? You may be a bit overwhelmed and not sure where to start. While major NCAA football games are broadcast on top networks like NBC, ABC, FOX, and CBS, as well as ESPN, it’s not easy to follow your alma mater or favorite college team if they’re in a less-prestigious league. This comprehensive guide will show you how to watch NCAA football without cable. With one of these options, you’ll be able to catch all of the major games and teams. What Channels Do I Need to Watch NCAA Football? Good question! This depends on the team you’re looking to follow. Here are a few of the channels that are the most essential for watching NCAA football. ABC/CBS/NBC/FOX – Games from the top 25 nationally-ranked teams can be watched on the “Big Four” broadcast networks every weekend. Every Notre Dame home game airs on NBC, as well. Big 10 Network – As you might expect, this network covers major games in the Big 10 Conference. SEC Network – Owned by ESPN, SEC Network is dedicated to coverage of the Southeastern Conference. ESPN, ESPN2, ESPN3, ESPNU – ESPN usually airs bowl games for major NCAA conferences, as well as most of the postseason. fuboTV, as a sports-focused internet TV “skinny bundle”, is a good choice for watching most NCAA football games – with one potentially deal-breaking exception. Find out more below. If you opt for the $45/month “fubo” package, you’ll get a pretty good number of sports channels, including CBS/Fox/NBC, Fox Sports 1 and Fox Sports 2, Fox RSNs for your area, NBCSN, PAC-12 Network, CBS Sports Network, BTN, Eleven Sports, and beIN Sports. You can add even more channels, like Stadium, by upgrading to the $50/month fubo Extra package. Alternatively, the fubo Sports Plus add-on costs $9/month and will get you some additional Pac-12 networks and regional sports networks, as well as Stadium 1, 2 and 3. The biggest problem? You don’t get any ESPN-owned channels like ESPN, ESPN U, or SEC Network. This may be a dealbreaker if you want to follow the biggest NCAA football leagues. fuboTV has a reasonable set of features. You can record up to 30 hours of content using the free cloud DVR, and upgrade to 500 hours of storage for a $10/month fee. You can also stream on an industry-standard 2 devices at once, and stream on a third device for a $6/month fee. Device support is also good. You can watch NCAA football without cable on your iOS/Android device, on your web browser, and on your Roku, Apple TV, Chromecast, or Amazon Fire TV. You can try it now for free with a 7-day trial. Sling TV is one of the first internet TV services. It first launched in 2015. Owned by DISH Network, it’s a pretty good way to watch NCAA football without cable, but the confusing channel packages can make it difficult to get the best deal. Sling TV offers three basic channel packages. If you opt for Sling Orange, you’ll get ESPN and ESPN-owned channels, including ESPN, ESPN2, ESPN3, and ACC Network. Sling Blue gives you local broadcast networks like Fox and NBC. ABC and CBS are not available, as well as Fox Sports 1 and 2, Fox Sports RSNs, NBCSN. You can combine both packages for $40/month, which is what we’d recommend if you want to watch NCAA football without cable. You can add even more coverage with the Sports Extra add-on. Confusingly, this add-on has different channels and a different price, based on which package you choose. The add-on costs $5/month for Sling Orange and will get you SEC Network and SEC Network+, Pac-12 Network, ESPN U, beIN Sports, Stadium, and ESPN Goal Line, and some other channels. For Sling Blue, the add-on costs $10/month and will get you beIN Sports, Pac-12 Network, and Stadium, among a few others. Sling TV’s confusing nature doesn’t stop with the channel packages available. You also get different features based on your channel package. Sling Blue channels can be streamed on 3 devices at once, while Orange-exclusive channels can only be streamed on a single device. There is no way to get around this limit. In addition, you have to pay $5/month for a cloud DVR with 50 hours of storage if you’d like to record any content on Sling TV. That means Sling Orange + Blue, the Sports Package, and DVR service puts you at a steep $55/month bill. On a positive note, though, Sling TV has good device support. Naturally, web browsers and all modern Android/iOS devices are supported. You can also watch Sling on major “living room” devices like Amazon Fire TV, Chromecast, Apple TV, and Roku. You can give Sling a shot with a free 7-day trial now, and see if you like this service. Hulu With Live TV was introduced in 2017 and has quickly become a preferred way to watch NCAA football without cable. Get the details now. Hulu With Live TV keeps things simple. You get a single package of channels – up to 70 in total – for $40/month. You also get a free Hulu on-demand subscription – an $8/month value – with your subscription, which is a nice bonus. As far as college sports channels go, Hulu With Live TV carries ABC/CBS/FOX/NBC in most regions, as well as CBS Sports, BTN, ESPN, ESPN2 and ESPNU, Fox Sports 1 and 2 and Fox Sports RSNs, ESPN Goal Line, SEC Network, and ESPN College Extra. You won’t get the PAC-12 or ACC Network, though. Hulu’s features are pretty good. You can stream on 2 devices at once, which is industry standard. However, you can stream on as many devices at once on your home WiFi network with the $15/month Unlimited Screens package. The cloud DVR is included in the price and provides you with 50 hours of storage. It can be upgraded to 200 hours of storage for $15/month, with the Enhanced DVR package. Enhanced DVR + Unlimited Screens can be combined for $20/month. YouTube TV was first launched in 2017 by Google, and is now a top contender among internet TV services due to great features and a strong package of channels. Like Hulu With Live TV, you can only choose one subscription package with YouTube TV, which will cost you $40/month. For your money, you’ll get the available CBS/ABC/NBC/FOX stations in your area, as well as CBS Sports Network, BTN, ESPN, ESPN2, and ESPNU, Fox Sports RSNs, Fox Sports 1 and 2, and SEC Network. You’ll miss out on ACC Network and PAC-12 Network, though. YouTube TV has a truly excellent set of features, which you get at no extra cost when you subscribe to the service. The biggest standout is the cloud DVR. The DVR is free, and you can record as much content as you want for up to 9 months, with no other restrictions. In addition, you can create up to 6 user accounts, and each one will be able to get their own DVR, recommendations, and more. Speaking of multiple users, YouTube TV also allows you to stream on up to 3 devices at once, which is better than most other services out there. Device support has also improved recently. When it was first released, YouTube TV was only available on iOS and Android, as well as the Chrome web browser and Chromecast. Today, though, you can watch YouTube TV on Roku and Apple TV, as well as smart TVs from manufacturers including Hisense, VIZIO, LG, Samsung, and Sharp. PlayStation Vue is on the expensive side but is a great choice if you have a large family and want to watch NCAA football without cable, while still allowing everyone else to enjoy their favorite content. Get the details now. The $45/month Access package will get you ABC, CBS, FOX, and NBC, as well as ESPN and ESPN, ESPN2, and Fox Sports 1 and 2, but that’s about it. For more coverage, the $50/month “Core” package offers Big Ten Network, CBS Sports, ESPNU, ESPN College Extra, Fox Regional Sports Networks, and SEC Network. Further still, the Elite package adds Stadium, but that’s about it when it comes to college sports. Additionally, you can add the $10/month “Sports Pack” to a Core or higher subscription. It includes a huge number of sports networks, such as more than a dozen Fox Sports RSNs, 7 NBC Sports RSNs, Eleven Sports, ESPN Goal Line, Longhorn Network, Stadium 1, 2 and 3, and NESN National. PlayStation Vue doesn’t just have an enormous selection of NCAA football channels. You also get great features. The best feature of Vue is that you can stream on up to 5 devices at once, which is much more generous compared to the rest of the picks on our list. You also get a 28-day unlimited cloud DVR at no charge. You can record as much content as you want, and save it for up to 28 days. Device support for PlayStation Vue is also excellent. You can stream on PlayStation 3 and 4 consoles, of course, but also on web browsers, Android/iOS devices, Amazon Fire TV, Roku, Chromecast, and Apple TV. DirecTV Now is run by DirecTV, which is owned by AT&T. 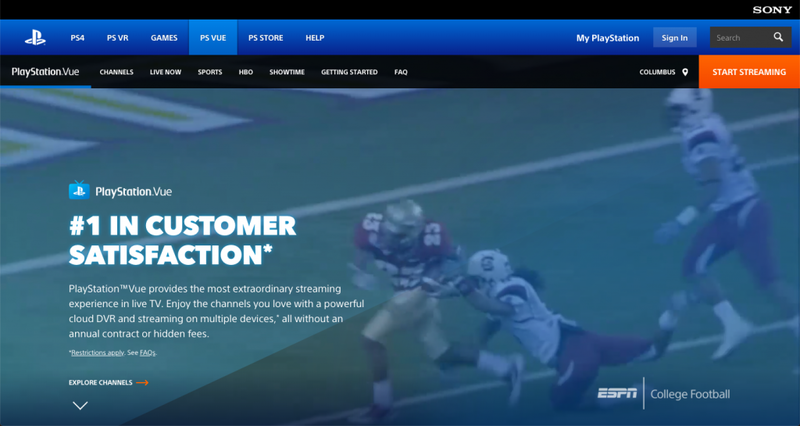 While it offers a good number of channels and is a decent way to watch NCAA Football without cable, getting comprehensive NCAA football coverage is expensive, and DirecTV Now is a bit lacking when it comes to features. As far as NCAA football is concerned, you’ll get CBS, FOX, NBC, and ABC, and ESPN and ESPN2, as well as Fox Sports 1 with the $45/month “Live A Little” package. For more sports coverage, the $55/month “Just Right” package includes BTN and ESPNU, as well as SEC Network. You can get even more college sports with the “Go Big” package for $65/month, which adds Fox Sports 2, and CBS Sports Network. Not only is DirecTV Now a bit expensive compared to our other picks, but its features are a bit sub-par, too. Until the middle of 2018, for example, DirecTV Now didn’t have a DVR at all. Now, subscribers get a free cloud DVR, but it’s limited to just 20 hours of content, with a 30-day content recording limit. You can stream on 2 devices at once, though, and add a third stream for $5/month if you need to. On the bright side, though, DirecTV Now supports most major streaming devices like the Apple TV, Amazon Fire TV, Chromecast and Roku, as well as streaming on web browsers, and Android/iOS devices. One of the big issues you may run into when choosing one of the above “skinny bundles” is getting all of your local ABC/CBS/FOX/NBC broadcast channels. Because each one of these “Big Four” affiliates is owned by different companies, each streaming service like Sling TV and fuboTV must negotiate with them independently. This means you may not be able to get all of them with your preferred internet TV service. So, what’s the best alternative? An OTA antenna! If you buy and set up an OTA (Over-The-Air) antenna, you may be able to get all of your local broadcast networks on your TV for free, allowing you to watch major NCAA games at no cost to you. For more information, check out this guide to OTA TV by Flixed. College Sports Live is a relatively new service from CBS Sports, offering broadcasts of a number of NCAA sports, including football, for just $10/month. Some of the teams with an agreement with College Sports Live includes Auburn, Illinois, Purdue, Wake Forest, Georgetown, Marquette, Penn State, TCU, Michigan State, and more. You can see their website for a full list of participating schools. Notably, though, there are some blackout restrictions on College Sports Live. However, it’s a low-cost way to watch NCAA football without cable, and a good option if your preferred team is a partner with this service.